Sandfire Resources has maintained production guidance for the 2019 financial year following strong output in the December quarter and ramp up at the Monty copper-gold mine. The company, led by the DeGrussa operation in Western Australia, produced 16,888 tonnes of copper and 10,427 ounces of gold in the December 2018 quarter. This result didn’t quite replicate its September 2018 quarter performance of 17,924 tonnes and 11,141 ounces, respectively. It was, however, still enough for Sandfire to predict that its 2019 production will remain at the upper end of guidance (63,000–67,000 tonnes of copper and 37,000–40,000 ounces of gold). 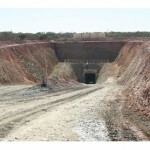 The Monty underground mine, part of the Springfield project tenement adjacent to the company’s Doolgunna project, was previously part of a joint venture (JV) with Talisman Mining. Sandfire purchased Talisman’s 30 per cent interest in Monty for $72 million last year and plans to feed the DeGrussa copper-gold processing plant with ore from the operation. Monty produced 4858 tonnes at a 2.66 per cent copper cut off, with first stoping ore scheduled for the next quarter. Sandfire has also made progress on a farm-in agreement at the Morck Well project, 22 kilometres from DeGrussa, with Auris Minerals and Fe. The company can earn up to 70 per cent of Morck Well — with Auris and Fe receiving a 24:6 split of the remaining 30 per cent — through exploration and feasibility study funding. Auris Minerals revealed via the ASX yesterday that Sandfire’s spending on the joint venture was $7.4 million to date.